I discovered Washington, D.C.’s Priests this past November when they signed to Don Giovanni Records, the New Jersey label that’s home to Screaming Females, Waxahatchee, Upset, and a slew of excellent punk bands. I’m always excited to hear their new artists. 2013’s Tape Two pummels through seven tense, scuzzy & snarling songs, Katie Greer’s vocals taking a cutthroat shout-singing command of tracks like “Leave Me Alone,” then escalating into Karen-O-circa-Fever-To-Tell yowls on “Say No.” Priests dissect icons from Lana Del Rey to the U.S. Constitution over spare guitars lacing a driving dance beat. It’s music that’s made to be heard live. 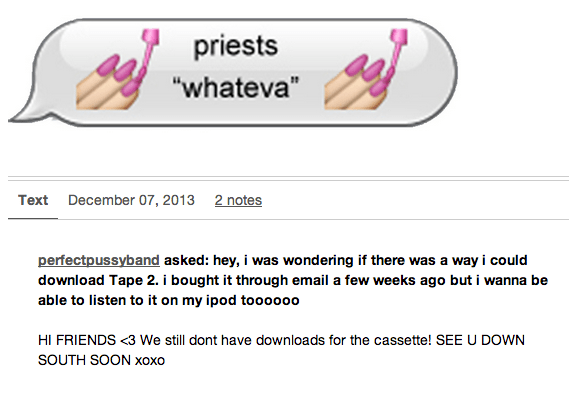 And though they release albums on Bandcamp and have an active Tumblr account, Priests deem themselves a “non-Internet band.” While a little ironic with Tumblr being the nexus of Internet culture, I like the notion of forcing listeners to find other opportunities to form their tastes and opinions without basing them (consciously or subconsciously) off of Facebook likes or Twitter followers. And thus, we have a great Sunday show booked in an all-ages space, with locals Crazy Bag Lady and Forced Entry opening. A fierce bookend on an excellent music weekend.